This study was designed to determine if Wnt signaling mediated through beta-catenin plays a role in the early proliferation and differentiation of human connective tissue progenitor cells (CTPs). Bone Marrow was aspirated from nine human donors. Marrow was processed to isolate CTPs in vitro using established methods, and cells were plated onto 16-well Lab-Tech chamber slides. At day 6, the cells were fixed using 4% paraformaldehyde in phosphate buffered saline (PBS), blocked with goat serum in PBS, and incubated/stained with a monoclonal mouse anti- beta-catenin antibody and a fluorescent secondary. Digital images were captured using an Olympus BX-50 fluorescent microscope and digital camera. Positive cytoplasmic staining was seen, consistent with the expectation that beta-catenin mediated Wnt signaling is present in the CTP population. These positive stain results were noted throughout the cytoplasm in clusters of varying intensities, becoming slightly brighter near the nucleus. These data suggest that beta-catenin provides a convenient and useful marker for early signaling in human CTPs, which can be utilized in subsequent studies. Signal transduction pathways are efficient systems that allow cells and other living things to amplify faint signals in order to create intense, vital responses. A key element of virtually any signaling pathway is the interaction and regulation of various intracellular intermediates within the pathway. Various studies (Miller et al. 1999, Novak and Dedhar 1999, Schwartz 2001) have shown that beta-catenin is a key signal mediator of both the Wnt signaling pathway and the integrin-linked kinase (ILK) pathway. One of the main differences between these two pathways is the location of beta-catenin within the cytoplasm and its proximity to the nucleus. Figure 1. Generally accepted summary of the canonical Wnt signaling pathway (right) and Beta-catenin's role as a cytoskeletal adhesion intermediate (left) (Howard et al. 2003). is a highly conserved pathway in the animal kingdom. Wnt genes encode for a large family of secreted Wnt proteins that act as extracellular signaling factors. Wnt genes function in several cellular activities such as cell fate determination, patterning, and migration in embryogenesis, apoptosis, etc. Fundamental to each of these processes is the regulation of the intracellular concentration of a multi-functional protein that acts in the context of Wnt and ILK signaling to modulate transcription of specific target genes. This intermediate at the center of the Wnt signaling pathway is beta-catenin (or Armadillo, the Drosophila homolog) (Brown and Moon 1998). Figure 2. The structure of beta-catenin. (a) The primary structure of beta-catenin: central domain consisting of 12 imperfect repeats (arm repeats) that interact with APC, tcf, e-cadherin, and fascin. (b) Topology (top) and ribbon structure (bottom) of the 12 imperfect repeats: circles and rectangles are alpha-helices viewed from the top and the side, accordingly; arrows run from amino-terminus to carboxyl-terminus (Nusse and Willert 1998). Image courtesy of Current Opinion in Genetics & Development.
. 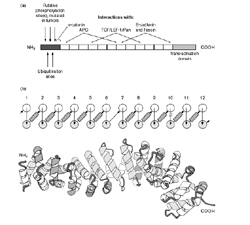 The amino terminus is said to be important for regulating the stability of beta-catenin, whereas the carboxyl terminus is most well known for functioning as a transcriptional activation domain (Nusse and Willert 1998). One of the most significant aspects of the structure of beta-catenin is that its arm repeat binding domain allows for overlapping interaction between multiple binding partners (Huelsken et al. 2001, Rubinfeld et al. 1995). This region is in the shape of a shallow groove, generated by the right-handed superhelical corkscrew orientation of the arm repeats, lined with basic amino acids that confer upon it a positive charge. It is this positively charged groove that could possibly serve as the docking station for several key proteins. This is suggested by the fact that the binding regions in several key proteins, such as E-cadherin, TCF, and APC are all acidic and by the fact that GSK-3's phosphorylation of APC increases its negative charge and thus its affinity for beta-catenin (Rubinfeld et al. 1996). In the presence of Wnt genes, a Wnt protein will bind with a member of the Frizzled (frz) transmembrane receptor family and initiate the Wnt signaling cascade. This interaction activates the Dishevelled protein (dsh) by hyperphosphorylating it, which prevents the phosphorylation of beta-catenin by the degradation complex (GSK-3, APC, and Axin). When not degradated via the proteolytic pathway, beta-catenin collects just outside the nucleus in the form of a cytoplasmic pool of free signaling molecules (Miller et al. 1999). Here, stable beta-catenin interacts with lymphoid enhancer factor/T cell factor (Lef/Tcf) and is translocated into the nucleus as a complex of beta-catenin/Lef/Tcf to stimulate target gene transcription (Novak and Dedhar 1999). In contrast, when Wnt signals are not present, beta-catenin is kept to low concentrations via the degradation complex and the proteolytic pathway. The degradation complex consists of four proteins: GSK-3, Axin, APC, and beta-TrCP/Slimb. Simply put, Axin and APC serve as scaffolds that bind to both beta-catenin and GSK-3 to facilitate the phosphorylation of beta-catenin's amino terminus by GSK-3 (Miller et al. 1999). The phospho-amino acids tag beta-catenin for ubiquitination by beta-TrCP/Simb. This ubiquitination acts as a second tag; thus, marking beta-catenin for degradation by a proteosome (Miller et al. 1999). Among the various essential outcomes of the Wnt pathway, there is a negative one as well. The deregulation of beta-catenin has been found to lead to various forms of cancer, particularly colorectal cancer. Studies have shown that if any one of the four proteins in the degradation complex is mutated, the intracellular concentration of beta-catenin will grow out of control and almost always lead to a form of cancer (Clevers and Mariann 2000). Other studies have also shown that APC mutations are the most efficient at causing cancer and that the abnormally high levels of beta-catenin can be down-regulated by exogenous wild-type APC (Munemitsu et al. 1995). Correlations between aspects of this work and that of previous works are quite abundant. For example, one of the ultimate goals of this project is to find a relationship between Wnt signaling via beta-catenin and the differentiation of osteogenic stem cells. In 2002, a group of scientists demonstrated that beta-catenin signaling plays a direct role in early osteoblast differentiation and in BMP2-mediated signal transduction (Bain et al. 2003). In addition to osteoblastic differentiation, various other experiments have dealt with the relationship between beta-catenin and stem cell differentiation (Reya et al. 2003; Willert et al. 2003). Furthermore, several other analogous works have lent themselves to discovering a link between Wnt signaling, cell proliferation, and stem cell self-renewal (Khan-Dawood et al. 1996; Mariadason et al. 2001). In addition to these works, others have utilized immunocytochemical techniques, such as western blot analysis and fluorescence microscopy, to localize various intermediates of the Wnt pathway, beta-catenin in particular (Hugh et al. 1999; Khan-Dawood et al. 1996). In a similar fashion, this study aims to use said techniques to determine the presence of beta-catenin within human, bone marrow-derived connective tissue progenitor stem cells. The control cells were human colorectal adenocarcinoma cells (ATCC, SW480) and the experimental cells were human bone marrow stem cells taken from the pedicle region of the spine and the iliac crest region of the hip via surgical aspiration. For a negative control, adenocarcinoma cells were incubated with only the secondary antibody. Both cell lines were grown on glass slide lab-teks with a population density of 2.5x105 cells/cm2 area. The culturing media for the bone marrow stem cells consisted of: 1000mL alphaMEM (Invitrogen, 41061), 100 ml FBS, 10mL penicillin/streptomycin, and 1x108 M dexamethasone. The media for the colorectal adenocarcinoma cells consisted of: 900 ml D-MEM, 100 ml FBS ml, and 10 ml penicillin/streptomycin. Ascorbate at 50mg/ml was added to both mediums (100:1 ratio of media to ascorbate). Media changes took place 3 times per culture period. Both cell cultures were incubated for 6 days at 37&deg;C, 21% O2, and 5% CO2. Immunocytochemical analysis was performed by fixing the cells with 4% paraformaldehyde and permeabilizing with 0.2% Triton X-100 for 5 minutes. To detect beta-catenin, cells were incubated for 60 minutes with a mouse monoclonal anti- beta-catenin antibody (NovoCostra, NCL-B-CAT) in tris-buffed saline/3% PBS at 37&deg;C and then for 60 minutes with a goat anti-mouse IgG1 FITC-conjugated secondary antibody (Santa Cruz Biotechnology, SC-2078). Preceding and following each incubation period, the cells were washed with 1x concentration PBS for 8 minutes under slight agitation. The lab-teks were then allowed to air dry in the absence of light until digital images could be captured using an Olympus BX-50 fluorescent microscope equipped with a Polaroid digital camera. Figure 3. Digital images showing positive staining for beta-catenin within adenocarcinoma (top) and human bone marrow mesenchymal stem cell cultures (bottom).
. The negative control cultures expressed no staining for beta-catenin. In addition to the positive staining seen in the control cell cultures, positive cytoplasmic staining for beta-catenin was also seen within the human bone marrow stem cell cultures (Figure 3, right). Consistent with what is known of Wnt signaling, staining was seen throughout the cytoplasm in clusters of varying intensities, becoming slightly more intense just outside the nucleus. Here, the nucleus appears as a dark void within a ring of fluorescently stained beta-catenin. As expected, positive staining for beta-catenin was seen throughout the adenocarcinoma cell cultures. This confirms that the Wnt signaling pathway, if present, is activated and unregulated due to what is most likely a cancerous mutation within its respective signaling pathway (Figure 3, left). These data suggest that beta-catenin is present within the early stages of human CTP differentiation and provides a convenient and useful marker for early signaling in human CTPs, which can be utilized in subsequent studies involving the characterization of human mesenchymal stem cells (hMSC) with respect to the of science of bone biology, stem cell kinetics, and CTP characterization. Immunofluorescent staining identified the general localization of beta-catenin within the human bone marrow and the human colorectal adenocarcinoma cells. The identification of beta-catenin, however, does not necessarily prove the involvement of the Wnt signaling pathway. The positive staining within the bone marrow does allow for the conclusion that not only is beta-catenin present, but it may be due to the presence of Wnt protein initiated signaling. In the ILK pathway, beta-catenin is translocated directly into the nucleus and there is little presence of any stable, cytoplasmic pooling. In the Wnt pathway, beta-catenin collects into a stable, cytoplasmic pool just outside the nucleus and is later translocated into the nucleus (Novak and Dedhar 1999). By comparing relative fluorescent stain intensities of beta-catenin within the nucleus and the cytoplasm, these data suggest that the Wnt signaling pathway is more likely involved in human bone marrow stem cells than the ILK pathway. Beta-catenin's existence within human CTPs is essential for the next step of this project in which tests will be run to manipulate this pathway and better characterize a more specific role for beta-catenin in early osteoblastic differentiation and proliferation. Ultimately, the primary goal will be to discover how Wnt signaling, beta-catenin, or both can be manipulated to further the science of bone biology, stem cell kinetics, and CTP characterization. The author wishes to express his appreciation to the members of the Muschler Lab for their undivided help and support with this study, the National Institutes of Health for financial support during the summer of 2003, and the Cleveland Clinic Foundation for its willingness to support and further independent undergraduate and graduate research. C3H10T1/2 cells and participated in BMP2 mediated signal transduction. Biochemical and Biophysical Research Communications. 301:84-91. Brown JD and RT Moon. (1998). Wnt signaling: why is everything so negative? Current Opinion in Cell Biology. 10:182-7. Clevers H and B Mariann. (2000). Linking colorectal cancer to Wnt signaling. Cell. 103:311-20. Howrd JC, et al. (2003). Elevated Levels of Beta-catenin and Fibronectin in three-demsional collagen cultures of Dupuytren's disease cells are regulated by Tension in vitro. BMC Musculoskeletal Disorders. 4:16-28. Huelsken J, et al. (1994). E-cadherin and APC compete for the interaction with b-catenin and the cytoskeleton. J Cell Biol. 127:2061-9. Hugh TJ, et al. (1999). Beta-catenin expression in primary and metastatic colorectal carcinoma. International Journal of Cancer. 82:504-11. Khan-Dawood FS, et al. (1996). Immunocytochemical localization and expression of E-cadherin and Beta-catenin in the human corpus luteum. Molecular Human Reproduction. 2;10:753-57. Mariadason J, et al. (2001). Down regulation of Beta-catenin TCF signaling is linked to colonic epithelial cell differentiation. Cancer Research. 61:3465-71. Wnt/Beta-catenin and Wnt/Ca+2 pathways. Oncogene. 18:7860-72.
the adnomatous polyposis coli (APC) tumor-suppressor protein. PNAS USA. 92:3046-50. Novak A and S Dedhar. (1999). Signaling through Beta-catenin and Lef/Tcf. Cellular and Molecular Life Sciences. 56:523-37. Nusse R and K Willert. (1998). 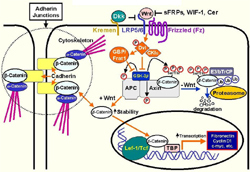 Beta-catenin: a key mediator of Wnt signaling. Current Opinion in Genetics & Development. 8:95-102. Reya T, et al. (2003). A role for Wnt signaling in self-renewal of haematopoietic stem cells. Nature. 423:409-14. Rubinfeld B, et al. (1996). Binding of GSK3b to the APC-b-catenin complex and regulation of complex assembly. Science. 272:1023-6. Rubinfeld B, et al. (1995). The APC protein and E-cadherin form similar but independent complexes with a-catenin, b-catenin, and plakoglobin. J Biol Chemistry. 270:5549-55. Schwartz MA. (2001). Integrin signaling revisited. Trends in Cell Biology. 11;12:466-70. Willert K, et al. (2003). Wnt proteins are lipid-modified and can act as stem cell growth factors. Nature. 423:448-52.